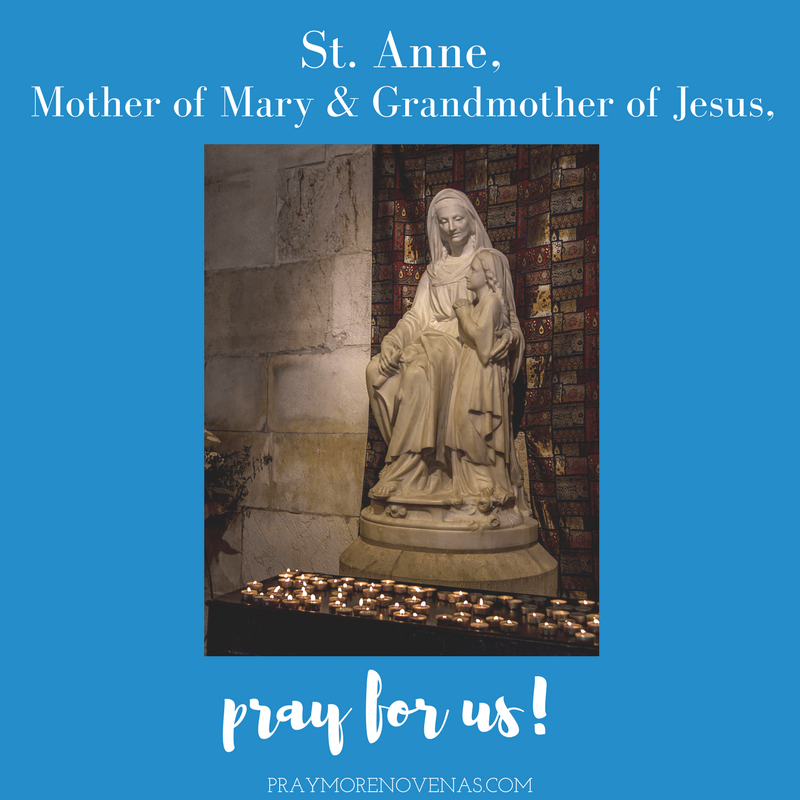 Here’s Day 4 of The St. Anne Novena! Prau that my son keep his eyes open for a betterr future. Dor mu daughter ro find a better job. Foe my eyesight to be cured and find a good doctor. I pray for my husband. I ask this in the name of jesus. Amen. Please pray for me , that my health will improve. I am asking our Heavenly Father to grant me His Blessings for the trials facing me now and in the future. I offer up my sufferings for all the poor souls in purgatory, and those suffering here on earth. Please pray for my marriage. It needs healing. We need to be honest with each other. Please help my husband to stop with his ugly habit. You know what it is. Please allow him to see how much it is hurting our family and allow him to heal. Teach me to trust him again. Dear St. Anne, please intercede and help my husband to stop buying things that we don’t need, and to get rid of things he no longer use. St. Anne please intercede for my daughter to meet her husband. Please St Anne, help me with my cancer I know I can beat this . I just need more strength and courage, please bless all the amazing ,loveing supportive people in my life that make it so wonderful. Speacialy my amazing husband ,please bless him and keep him safe. Amen. And thank you for these novena I look forward to them everyday. God bless you both. This is a special month for all Christian mothers and all who dedicate their lives in Christ. Through the intercession of St. Anne and our blessed mother Mary may our intentions be granted, AMEN. Thank you for this lovely Novena , St. Ann please pray for R and M.
Pray for the youth ministries and the difficulties these young people who are constantly distracted from the latest gadgets. Protect the family and may God’s will be done always first and foremost. Pray for all the people doing this Novena and protect their family and friends. Praying for the Legion of Mary group in my community. Blessed Saint Anne, through the intercession of Jesus Christ bless and keep the marriages of all holy people alive in Christ and refreshed spiritually and lovingly each waking day. Saint Anne, if it be Gods will to lead me to a good and holy man please join me in that journey. I long for companionship and a healthy relationship where joy is abundant. St. Anne , please intercess on my behalf to our beloved sweet Mary for healing in my body and allow me to be made ready for a husband and a marriage that would allow us to serve Christ’s purpose in helping others heal, if it be God’s divine will. Dear Blessed Saint Ann, I ask for your intercession in helping me to find a Godly husband. If it is God’s will, please lead us to find each other. I also ask for your intersession for both my son and my daughter that they allow Christ into their relationships so that they will have relationships that are holy and pleasing to God. I also ask for your assistance with my losing weight and adopting a more healthy and active lifestyle, where I have more balance between work and home. I ask that my work may more appropriately not consume my whole life and all of my waking hours as it has been and that it will only demand the time I am being paid for. I also ask that I will return to full time pay for my work as well. I ask this with gratitude and confidence, in the name of Jesus Christ, by your inter session and the power of the Holy Spirit. Please grant me through your prayers And Grace the gift of vocation of Holy Matrimony. Bless and please find me a Godly husband. Please pray that my husband and I will feel more comfortable with today’s fast pace of life and changes. For good family life etc. Please grant me through your prayers And Grace the fit of vocation of Holy Matrimony. Bless and please find me my Godly husband. To fall in love with a man I can marry. Intercede for me Saint Anne for my nephew and his new wife will have a strong, holy, healthy marriage and they will return to the Catholic Church. Pray their future children will be joyful, healthy, normal with an easy, safe, pregnancy and uneventful delivery. Pray for my 104 old friend for peace, protection,calm and a death without struggle, nor fear. Please bring C and I back together in loving relationship and heal us for the higher good. Marriage, Family and children. Saint Anne if it be Gods will to lead me to a good and holy man please join me in that journey. I pray for God the Almight Father to place his grace upon my husband and son to heal and strengthen their relationship. I ask this through Jesus Christ and the interceptions of St. Anne. Dear St Anne please blessed and pray for me to be the topnochers of nursing licensure examination on November 17 and 18 with the average of 88%…please give me more knowledge and wisdom to concentrate on my review that everything will retain in my memory i can answer my board examinations correctly…Give me more strength in my everyday life. Amen..